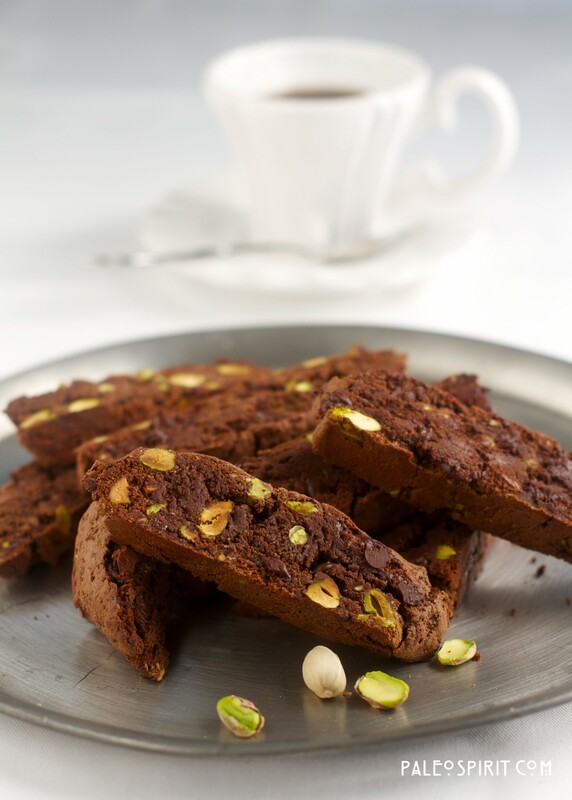 Living in Italy many years ago I first became acquainted with biscotti. 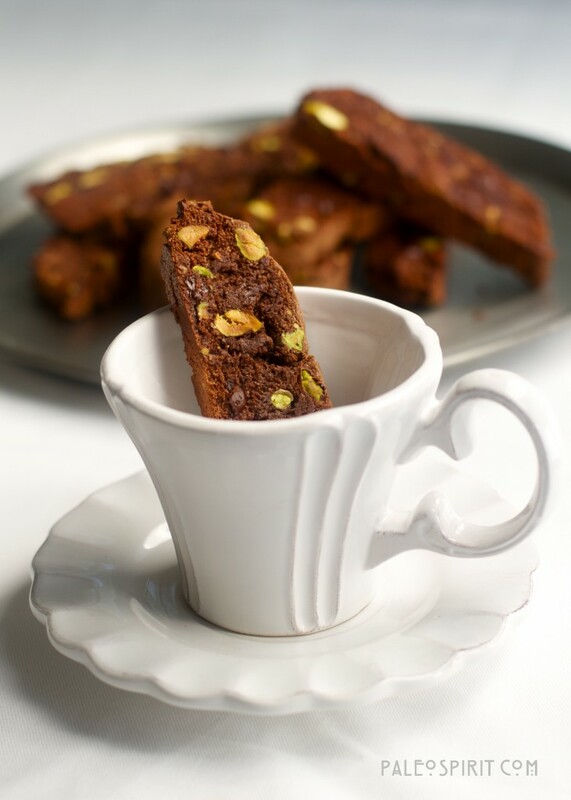 It was long enough ago that biscotti were not well-known in the United States. After returning home, I hosted a feast for my extended family that included an authentic almond biscotti recipe. It was something new for my family. The recipe I used was from an Italian cookbook I had purchased in that country and the resulting confections were quite crunchy and dense. In fact, I will never forget how my great aunt Ann enjoyed them. She enjoyed them in spite of the fact that she might have popped her jaw out of place trying to crunch one! The recipe I have for you today is quite different. This is a grain-free, paleo and vegan recipe for chocolate pistachio biscotti. It uses almond and coconut flours and the resulting cookies are nicely crunchy but not so dense and hard that you will break a tooth or hurt your jaw. My great aunt Ann has passed away now, but I’m quite sure she would have enjoyed these biscotti even more than the “authentic” version. School is back in session for us this week. After school my boys and I enjoy having a snack together and talking about our day. Taking the time to connect with loved ones is important. But it is also important to nourish other friendships by spending time together. Sharing food and drink can be an important part of bonding. It is also a great way to show hospitality – something that seems almost a lost art these days. 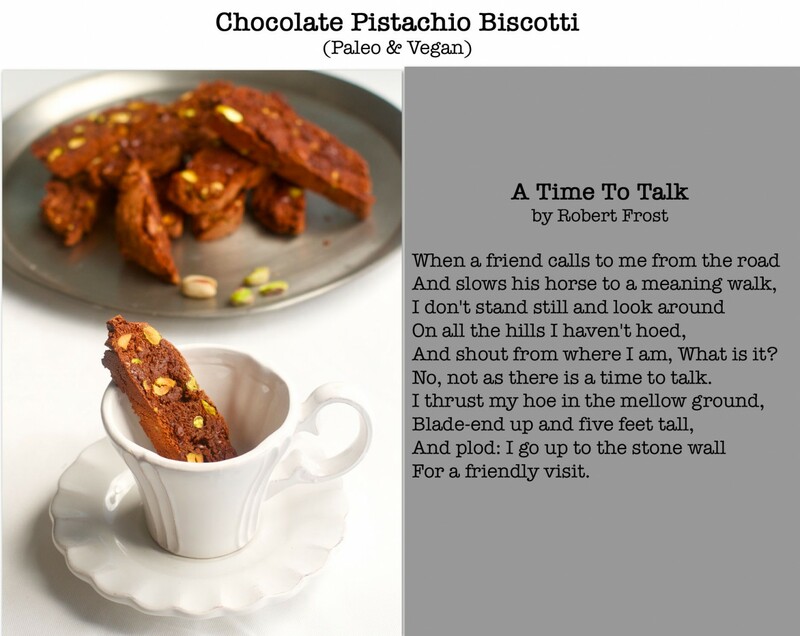 I love the poem “A Time To Talk” by Robert Frost. It reminds us of a simpler time when life had a more leisurely pace. It speaks of a man working in his field but taking time to enjoy the company of a good friend who had stopped by. He forgets, for a little while, his responsibilities and chores and simply enjoys spending time with his friend. We should all take a little “time to talk” with people we love and maybe even open our homes in hospitality to someone new, someone who might become a friend. Add almond flour, coconut flour, cocoa powder, baking soda and salt to a food processor and pulse until combined. Form the dough into one log on a baking sheet lined with either parchment paper or a Silpat (silicon pad). Bake for 15 minutes then allow to cool completely – about one hour. Place the slices on their sides on a baking sheet and cook for 15 minutes at 350 degrees F.
Allow the biscotti to cool completely before serving. They should be fairly crispy. Indulge in the lost art of hospitality. 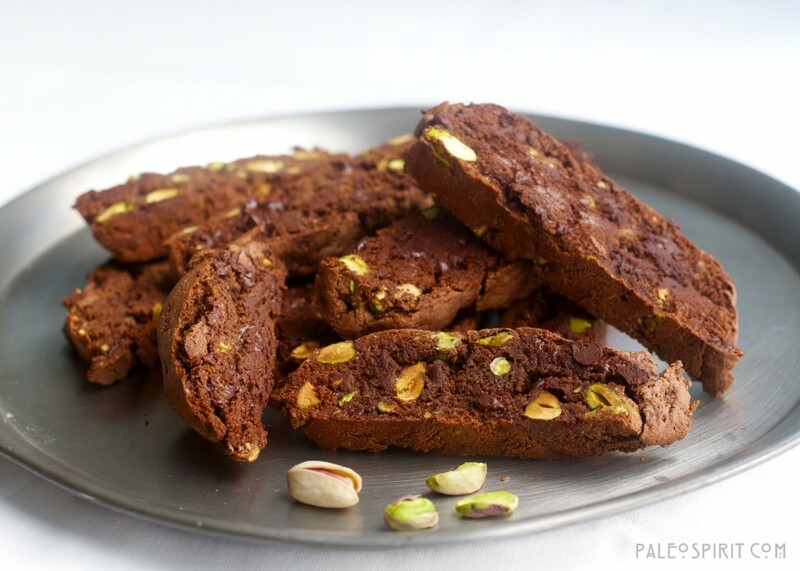 Take the time to share some of these paleo chocolate pistachio biscotti with a friend. 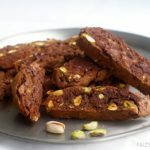 50 Responses to "Chocolate Pistachio Biscotti (Paleo & Vegan)"
My husband just had one at breakfast and reassured me of their tastiness. 🙂 He works SO hard as a taste tester. I make these often and even send them to my college-student son across the country! I had no problem using Bob’s Red Mill almond meal/flour…I had already purchased the product for the recipe before I made my first batch….BUT I gave the flour a few pulses by itself in the food processor before adding the other dry ingredients, no problems. I would recommend getting your hands in there for the final mix and shaping of the log. I did it by spoon the first time and the consistency of the dough did have some cracks and rough edges. I did not have that problem the second time when I did the final blend and shaping by hand(s). These are a huge hit and unlike many gluten free treats, this only uses a few ingredients and it is EASY! OH, big one, I use an electric knife to cut the slices. Coconut flour is a strange thing. One quarter cup doesn’t sound like much but it really absorbs a lot of moisture. I am sure the recipe would work with just almond flour but you would need to get the measurement right. I would guess you could sub 3/4 cup of almond flour to replace the 1/4 cup coconut flour. And the maple syrup is pretty sweet so using such dark chocolate would probably be fine. It really depends on your taste. Good gracious these look great! Nice pictures – makes my mouth water. I’ll be making these next week. 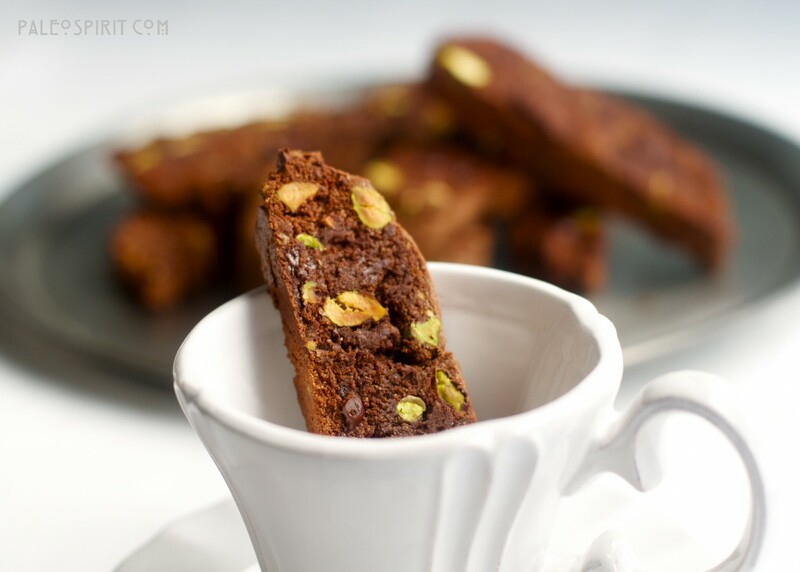 I often host a tea party at my house and these biscotti are perfect! Yay for tea parties! Thanks for the compliments, Hannah. Gosh these are yummy. Thank you! I like things not so sweet so used 1/3 c maple syrup and subbed the difference in coconut oil to have enough moisture. I also only used 1/3 c nuts and 1/3 chocolate as that is all I could fit in the dough (when I put it into a ball, the rest fell out) . Delish! Thanks so much. Love these. I made this last night. I have already recommended this recipe to everyone I know on paleo, gluten free and vegan diets. Thanks so much. I have to say yours are much prettier than mine though but still tasted great. The only thing I did different was that I broke up a dark chocolate bar (72% from trader Joe’s) and used that as the chocolate chips because I couldn’t find any at the store. Wow. These were so great. I can’t believe they came out so good, just based on the ingredients. My goodness. 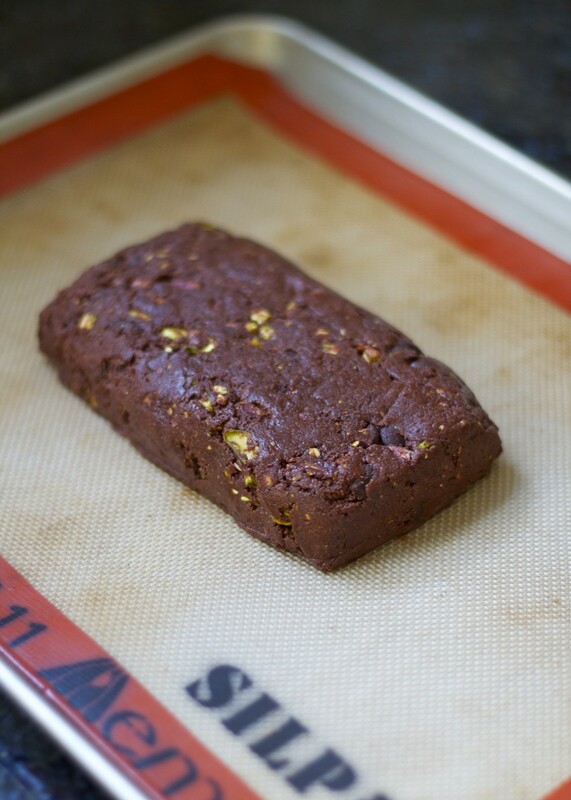 I used to make chocolate almond biscotti before going paleo and I just figured my biscotti making days were over. Thanks a bunch for the recipe! These were fantastic! I left out the chocolate chips, used almonds instead of pistachios and added some almond extract! The variations are endless! Hi I would like to try this with almonds instead of pistacios as well. How much almond extract did you use? This recipes looks very delicious and simple. I love the combo of these two. 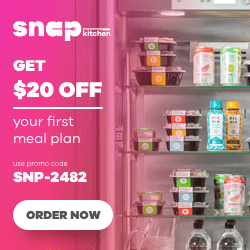 I have found your blog/site accidentally on Foodgawker, but I immediately signed up for newsletter. I love these biscottes, and I am going to try them for sure. I also loved the poem, thank you for your thoughtfulness. so mine completely fell apart when i tried to cut them – what do we think that’s about? they’re so delicious but kinda crumbly. is it me? anyone else have that trouble and/or know how to fix? Carey, What kind of almond flour did you use? That can make a big difference. Almond meal or something like Bob’s Red Mill brand won’t produce the same results as something like Honeyville. Just a thought. oh really? who knew! I definitely used Almond meal – from Bob’s Red Mill – oops. That must be the issue. Thanks so much! Had same issue- taste fabulous, but mine fell apart as well. Used Bob’s.. But they are soo soo yum! I made these and used unsalted almonds in place of the pistachios. They were so good that I made them 4 more times within 2 weeks. My husband, who is hard to please even likes them. YUM!!! Yum, these were really delicious! I used honey instead of maple syrup and took less of it, and instead of chocolate chips I had hazelnuts (and pistachio). GREAT texture and GREAT taste! Thanks! Just made these – absolutely delicious and took care of my chocolate craving in one bite! Thank you for sharing. I LOVE this recipe. Leaving out the cocoa and adding a couple more Tbsps of coconut flour and 3 tsps of anise seeds and about 3/4 tsp of almond extract makes biscotti that tastes exactly how my mom used to make it. THANKS!!! Can the maple syrup be replaced with stevia? The recipe really needs the liquid volume of the maple syrup. You could possibly replace the sweetness of the maple syrup with the stevia but you would need to add additional liquid. Good luck. Would using some coconut oil work for liquid? No, you can’t really replace liquid with oil in a recipe. I would recommend just using water. I’ve never tried it so I can’t really guarantee how it will turn out using water/stevia instead of maple syrup but oil would behave too differently. I just made these. Oh My Gosh! These are amazing! Firstly, thank you for such a wonderful blog! 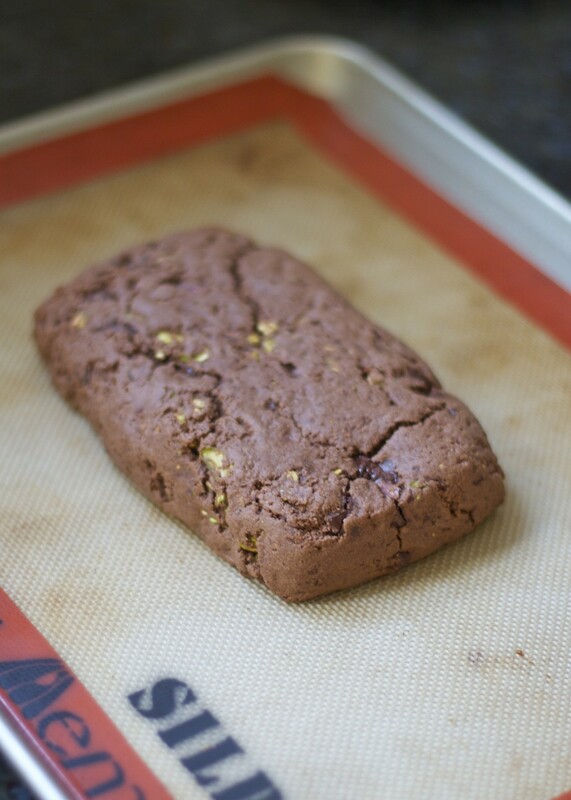 I made A LOW SUGAR version of your Chocolate Biscotti… and it’s still DEVINE! Your Chocolate Pistachio Biscotti is incredible and I am seriously addicted! However, since I am currently working hard at being sugar free, I played around with the amount of Maple Syrup required – and with spectacular results! As much as I love the inclusion of Maple Syrup with all its nutrients, it’s still a sugar. My goal was to retain the gorgeous texture and taste your recipe provides, but really lower the sugar/carb content – without the use of artificial sweeteners. Instead of using 1 cup of Maple Syrup, I only use 1/3 cup of Maple Syrup and 2/3 cup of Warm Water. For sweetness, I add 16 drops of Sweet Leaf STEVIA (Toffee Flavored) into the liquid mix. I omit the Chocolate Chips simply because we can’t get good quality ones here in Shanghai. Cooking Instructions are the same. Eh voila! 6 net carbs and only 110 calories each slice. Perfecto! 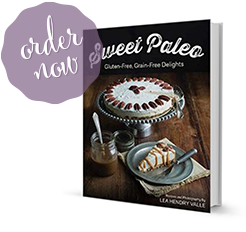 You have saved my paleo / low carb lifestyle Lea! Your comment has made my day…my week, actually. Thank you so much for the encouragement. It is much needed! And I am very intrigued by your recipe variation. It’s good to know it works with less sugar. It’s been a while since I made these so maybe I’ll give a try your way this weekend. So delicious, I ate way too many! I added some dried Montmorency cherries. A little concerned about the amount of sugar from the syrup. But, tasty! Your recipe looks delicious. The thing is, I only use date paste as a sweetener. Do you think I could just sub out the maple syrup for 1/2 cup of date paste without changing the outcome of the cookie? Thanks. Hmmm. The maple syrup is important not only for the sweetness but also for the moisture content. There may be a way to add liquid to the date paste to get a consistency closer to maple syrup. It might be worth a try but I haven’t done it yet so I can’t guarantee the results. I just made this today , but I used dried berries to replace chocolate chips and pistachios , it’s taste amazing ,crunchy , gooey .Luv it ! Thank you soon much for sharing this exquisite wonderful recipe ! May luck be with you ! Thank you! I’m so glad you liked the biscotti. I like the idea of using dried fruit instead of the chocolate chips. I’ve juste made it, but the result is not that wonderful, first I burn them, then the dough was not that high, so it seems more slide cake than a biscuit. Though the taste is not that bad, but I substitue the mile syrup with agave syrup, but maybe this one gave a more wet consistence to the dough. whatever… thanks for the recipe I ‘ll do better next time! Thanks for the comment. I’m very pleased you like the recipe. Pecans instead of pistachios sounds delicious. Your cookbook version of this recipe says 1.5 cups almond flour (vs 1 cup above). Which of the 2 amounts do you currently recommend? Either recipe should work. When I wrote the cookbook I reworked some older recipes like this one in order to standardize the flour measurements to weights in order to get standard results. So a cup of almond flour in the cookbook (page 28) is 100 grams. For the chocolate biscotti recipe that means 150 grams for 1 1/2 cups. The original recipe found on the blog was just created when I wasn’t using a scale to weigh flours so 1 cup just scooping out flour out of the bag is probably closer to 150 grams than if you were to weigh out the flour to what is “technically” one cup (100 grams). Based on your comment I went in and updated the recipe to explain that so, hopefully, people can tweak it based on how they are measuring out the flours.